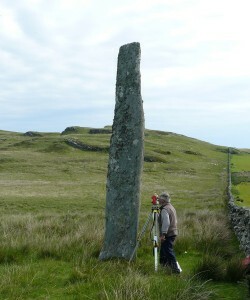 The site is in North West Islay. It was visited by Pennant in 1772 who wrote of "Three stones of stupendous size". Only one of these stones now remains but it is one of the finest in Scotland. 5.0 x 1.1 x 0.3 m.
The rocky outcrop about 1.7 km. to the North West and near the coast is well indicated and is an obvious feature. It provides a foresight for the setting moon at the extreme North. Note 1. The great majority of the other 15 lunar sites give declinations within less than 1′ arc of the theoretical value. 1′.5 would usually be considered very good but in the present context, not so good. Why then is it not less? The probable answer lies in the fact that the upper limb is being observed, and it has to be visible. 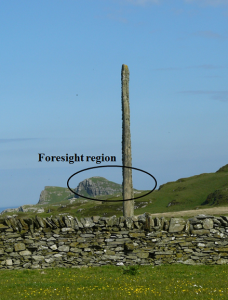 (See note 3) There are two good foresight regions as marked and by having the maximum declination position as shown would make the moon more visible. Note 2 Thom (1978, pp169-170) considered the reappearance of the moon at the bottom corner was for the 'no wobble' declination. However it is not possible to observe such a position without already knowing where it would be from other observations. See Discussion; Supposed 'no wobble' alignments.